Home » Eye Care Services » Contact Lenses » Who Can Wear Contact Lenses? Contact lenses can be appropriate for any age. 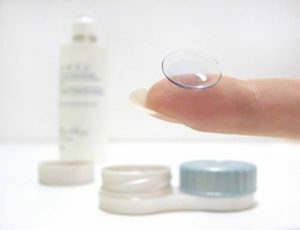 Sometimes medically necessary contacts are fit on infant children who have had lensectomies due to infantile cataracts. In elderly patients, handling of the lenses has to be a consideration. As our eye doctor can explain during your next eye exam, all patients can be evaluated for contact lens wear. We recommend back up glasses for all our contact lens patients. Glasses can be a good way to give the eyes a break from contact lens wear. There are activities like outdoor sports and hobbies wear contacts function better. Contacts can allow different types of sunglasses to be worn for outdoor sports like fishing and biking. Many sporting activities can be enhances by contact lens wear. Sometimes specialty large diameter lenses have to be fit for active sports. Correcting small amounts of astigmatism can bring athletes vision to better than 20/20. Yes, you can swim with contacts. You have to keep your eyes closed when you go under water unless you have goggles or a scuba mask on. Contacts are excellent for scuba diving. Optometrists usually specialize in the fitting of contacts, where Ophthalmologists train in surgical procedures. The specialty has grown for Optometrists to include contacts for dry eye therapy, irregular corneas like keratoconus, and post-surgical corneal transplant cases. For odd shaped eyeballs, there are many new designs and modalities. Many toric contact lenses to correct astigmatism and multifocal contacts that correct distance and reading vision come in daily disposable type lenses. Some contacts are made for overnight wear. Napping is usually not an issue. Not all patients can wear lenses overnight, but with proper fitting and expectations, overnight wear can be accomplished. We also carry contact lenses that change eye color. Opaque contacts can turn a blue eye brown and vice versa. We also have enhancers that can give a little sparkle or mildly give a little extra blue or green. We strive to make first time contact lens wear a comfortable experience. We give one-on-one training and explanations making sure patients are comfortable inserting and removing their lenses. We have contact lens specialists on staff to assist patients and answer all their questions. Most patients can learn on their first attempt; however for those that require more training and visits, we are here for them. Proper fitting and examination for contacts require other testing procedures and measurements that are not done during a routine comprehensive eye exam. A contact lens examination is a separate exam making sure the contact power and fit delivers the best vision and most comfortable wear.